Oxtail was not something I liked when I lived in Dominica. People around me raved about Stewed Oxtail all the time, but I thought it was too chewy and way too much work to eat that little bit of meat on the bone....Well that was until I discovered braising. Now, this is not how Oxtail would be prepared in a typical West Indian home, HOWEVER, this method leads to a simply divine, mouth watering delicacy! Remove excess fat from oxtails, season with salt and pepper and set aside for 30 minutes. Boil wine in a sauce pan until reduced in half. In a large dutch oven, heat 1 tbsp of butter over high heat. Place half of the oxtails in the pot in a single layer and brown on all sides, remove. Place another tbsp of butter in the pot and brown the second half of oxtails, remove. Reduce heat to medium, add 1 tbsp of butter, add onion, carrot, celery and garlic. Sauté for about 5 minutes or until soft. Place oxtails, thyme, bay leaves, and parsley stems on top of vegetables. Pour in reduced wine and enough water (or beef broth) to cover the oxtails. Stir and bring to a boil. Cover and place in the oven for 3 hours or until meat is tender but not falling off the bone. Remove oxtails from pot and place in a dish (like the one pictured). Garnish with curly parsley. 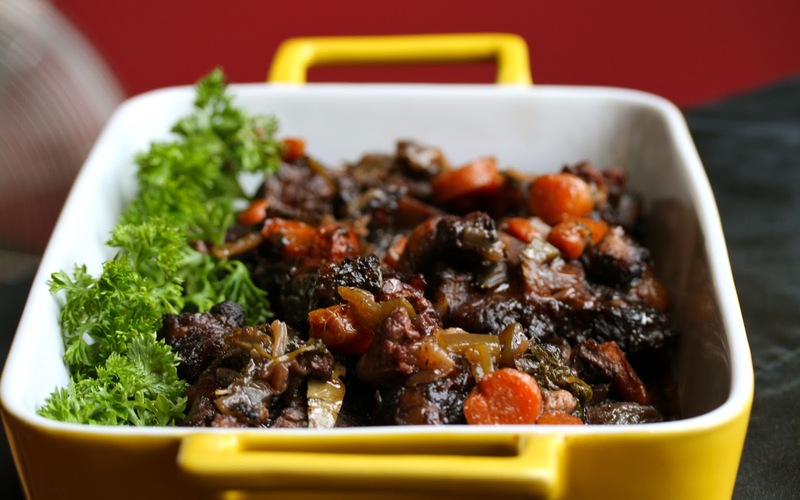 With slotted spoon, remove veggies and place atop oxtails. Pour remaining liquid into a medium saucepan and boil until thick and shiny, whisk in remaining 1 tbsp of butter. Looks great!!! I'm sure to mess it up! lol. Thank heavens for "cooking with Val"! I'm sure you will do it just fine! I was reluctant to try oxtails, but this recipe is scrumptious! Very tender and flavorful! Val personally cooked it for us, which made it even better. I can't wait to try to make it myself.